A few moments ago, a woman appeared at my doorstep with a package for me. Since it was about 19:30, I was a little perplexed – this isn’t a very usual time to be delivering packages. Also, this was a woman who I’ve seen walking around town before – she’s a local. She handed over the package, and when I saw the note on top, I was even more intrigued: “From Trevor Dickinson, A-EON Technology“. A couple of months ago, Dickinson contacted me, stating A-EON wanted to send me a package. It’s taken a little longer than expected, but that’s the package which arrived just now, on my doorstep. I know that said package would have something to do with the processor inside the AmigaOne X1000, but that’s it. Dickinson asked me to video or photograph the process of me opening the package. I actually made a nice HD video while opening the package, but sadly, since that camera is broken, the video file ended up being a 0kb dummy file. In other words, we’ll have to settle for photos. And here they are. Feast your eyes on this. I literally nearly died of laughter when I ‘read’ the cake. I’m sure there are very few who will understand this (other than a small few in the Amiga community), so let me explain. It’s crazy. You see, about a year ago, there was a considerable amount of speculation going on about what processor would be used inside the AmigaOne X1000, the new high-end Amiga A-EON Technology is working on together with Hyperion (the company behind AmigaOS4). All the rumours and discussions always led to one candidate: P.A. Semi’s PWRficient PA6T processor – the dual-core 16xxM to be exact. So, when I opened the box just now, I really couldn’t stop laughing. I think this is quite possibly the coolest and most original way any company has ever announced which processor they will use for their computer. Of course, evidence has been stacking up the past year, and I was getting ready to do something with the sock-remark anyway once A-EON would make it official, but still – this is way cooler. Another fun fact is that the cake has been made by Nina Goudsblom, a local cake artist here in my hometown, which makes this all the more special to me because despite years and years of friends calling me crazy, I refuse to move away from my small hick town in the middle of nowhere. I’m sending Nina an email to thank her for her beautiful work. So, the AmigaOne X1000 will be powered by a PWRficient PA6T 16xxM dual-core processor. Thanks, A-EON en Trevor for the wonderful cake – I’ll be sure to enjoy it with my family over Christmas. I’m not sure if this constitutes a blogging breach of ethics, but if it does – hah, at least it’s a tasty breach! it’s a shame you couldn’t make it to amiwest this year out in california, but this just goes to show what a nice guy trevor is. Indeed, a bet is a bet… Are you a man of honor ? If I was in that position, I’d go ahead eat my socks, too. But only if they were red velvet with cream cheese icing. You should take pictures of yourself shoveling a large piece of sock-decorated cake into your mouth. A very delicious news scoop indeed! Iâ€™m totally stunned by the amount of thought that went into this. For rubbing something in your face, you canâ€™t argue they didnâ€™t pull the boat out on this. Kudos to AEON and the Amiga community! If only their sense of business is half as good as their sense of humor, they would effectively resurrect the Amiga as a major platform. Unfortunately, I don’t see it happening. If they will, I’ll eat my Ferrari (any reference to http://southpark.wikia.com/wiki/Hell_on_Earth_2006 is unintentional). Why, yes, the next iteration of AmigaOS will be named GLaDOS. Still less than 2 weeks until to go until the end of year. I look forward to read reviews about the 1st SMP enabled AmigaOS on the market. THIS is why I feel OSNews is a great place to read about and discuss technology news! There’s always a pleasant surprise around the corner. Some of us here in the tech community are getting into augmented reality, i.e. supplanting the real world with a technological overlay. This event is a great example of the opposite: Bringing real, physical humor into the world of processors and operating systems. I hope you and your family enjoy the hell out of your socks over Christmas, Thom, and have a merry one! It’s nice to see in an era when the tech industry is run by absolute jerks, there is still someone with a sense of humor. 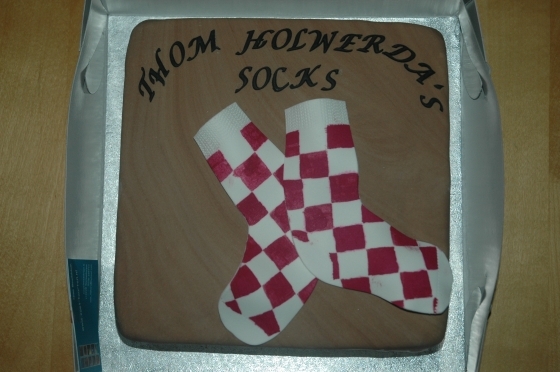 The Amiga Community is about this…..creativity, humour, and fun cakes! On paper, it seems like a very good CPU. Does anyone know what the consequences will be for the Amiga OS? does this CPU offer greater functionality and performance than Intel CPUs? what is the advantage of this CPU? It was a great cpu in its time (a few yeasr it would have attraced me stropngly) and today is still a nice one, ableit waaay to expensive and not really up to date. The reason for OS4 to chose PA6T is plain and simply that it is a ppc and thus offers a big endian data type. And OS 4 is ppc/big endian only. A switch to x86/little endian for that OS is far from trivial if you want to keep backwards compability. Diffrent to most other OSes OS4 shares structs between the OS and apps, if these dont match the same endianess you are in deep trouble. The same is true for MorphOS. If the PA6T or any othe rppc is only a particuar choice, but generally the PA6T is a nice cpu, albeit not developed any longer and not my first choice (which Freescale 86xx or some QorIQ chip). IMHO PA6T is supoerior to Freescale’s 86xx choices. PA6T is a G5 class 64bit core, 86xx is a G4 class 32bit core. QorIQ for the moment I think also is less desirable than PA6T, though they do finally have 64bit and seem to plan a return of Altivec, so I do very much look forward to news there for something I hope will be comparable to PA6T and have a future which PA6T does not. PA6T has a good number of SERDES for PCI-Express and other things, with more configuration options than other PPCs, and until QorIQ adds a couple more things I think PA6T is still king of PPC, and however they managed to get some chips I think it’s a fantastic choice when restricted to PowerPC. I’m no expert on the way these OSen work, so bear with me. Would it be easier to port to say, Ultra/OpenSparc? Don’t they have the appropriate preprocessor definitions, macros and functions that would allow them to solve the endianess issue? I believe x86 now has extensions to load and store big-endian. It could easily be made a compiler option to simply switch the endianness. Even without the a simple runtime option, the endian could still be configured in the compilers OS description file. What a good idea to distract everyone from the fact that the X1000 simply isn’t coming along so well. Perhaps, but for once I’m going to hold back my cynicism. Personally I’m happy with Protracker and AmiBlitz on my A1200, and I’m looking forward to working on something for AROS when I’ve done enough research and got the thing to run properly on my laptop; but that doesn’t mean I’m not happy that Trevor is taking the Amiga to new places and inviting us along for the ride. I wish him, my favourite computer and all the Amigans out there a merry drinkmas and the best of luck for the new year. Maybe we can all get along in 2011? Anyone remember Vroom? Just rediscovered this little racing gem last night. It’s even made me put down F1 for the ps3 I got last week. I’m not going to be using these OSen, but I’m glad they and new hw exist. At the least, because maybe the next Hirasawa Susumu album will be more lush and intense, as he uses Amigas to compose/sequence his music. More power in the hw would allow him to not get bogged down with any speed limits and just compose. Thumbs up for both A-EON and Nina. Well done. Is A-EON going to have enough processors? It’s not like they’re made any more. I would say it grows fine! The Amiga Community is strong and stubborn like hell…they refused to die a long time ago! The AmigaOne X1000 and AmigaOS is a killer combination, and shows once again that THE AMIGA IS ALIVE AND KICKING!! The Amiga situation is better than ever! Amiga today (and in last 15 years) is a bunch of small groups of enthusiasts who doesn’t care about the platform, but only targeted to theirs personal goals. Instead of single future-proof hardware platform and single OS platform we have non-compatible, not future proof HW + 4 Amiga-flavour OSes. When you cater to a community like Amiga users, putting geektastic custom chips on the mobo makes perfect sense because these are the very people who would get use out of it. I don’t see how a few programmers who would buy X1000 hardware can make something useful with this technology for these who have SAM, for example, without said chip. Think about the third-party software situation for their OS(en). Do you really think they’re not writing their own software? Someone will hack something cool out of that chip, and hell, you can probably already do something with it on Linux, which will run on the box as well. Actually, that’s exactly what I like about it. I’m saying that if they got the remaining stock, possibly even a single run, that it’s probably enough to meet demand. If they made too many, it would actually hurt the future of the company! Great platfrom. Great community. Great news. The best news in this (2010) year. I’ll definitely buy this machine. The greatest desktop computer in these days. Cool, fine, great. Can’t find more appropriate word to say PERFECT. The only thing I doubt: can these machine makers make enough machines? Say, 1000 per day. I’m sure, market will require at least 1000 machines per day.